A Lansing man will be spending the next 16 to 25 years behind bars for murdering an East Lansing man. 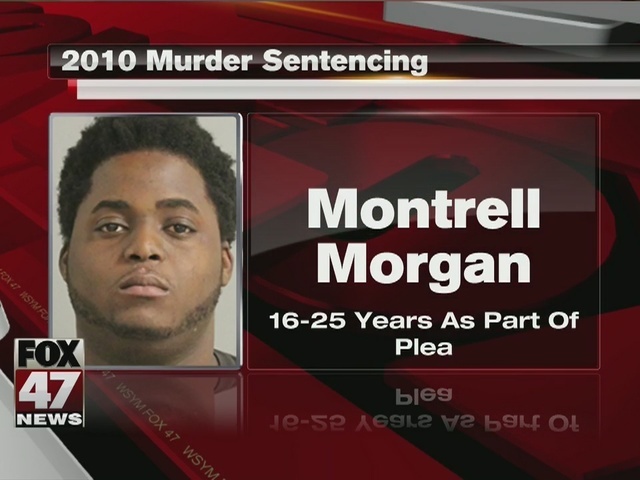 23-year-old Montrell Morgan was sentenced Wednesday morning for second-degree murder in the death of Adrian House. House was killed in East Lansing on December 11, 2010. He was found shot to death in a vehicle on Abbot Road following a confrontation at a party at The Crossing Place Apartments on Coleman Road in Bath Township. "This was a 5 year active homicide investigation, that came to a successful conclusion today," said Detective Scott Wriggelsworth of the East Lansing Police Department. "We are pleased that justice was done for the House family. The East Lansing Police Department would like to thank the federal, state and other area local law enforcement agencies that assisted us with this investigation."